Cement Brick Making Machine is a good product to start a new business. Our factory in Tukey produces Turkish bricks machines under its name Mussan Group with two-year warranty. Our models of cement brick making machine are named according to the abbriviation – MG, of Mussan Group. In our factory models of Cement Brick Making Machine differ in size, in speed and functional capabilities. For example, some of the machines work as cement brick layers, which press on dry concrete mixture in molds directly on the ground. Bricks lately can be collected and put in warehouses to dry. Those machines are recommended to be used with automatic concrete mixer with forklift car for full speed maintaining. Those kind of machines can produce up to 5000 pieces of concrete blocks per day. Cement Brick Making Machine could also be used as thermal isolation forhouses. Thermal isolation blocks has two concrete walls and styrofoam isolation between. The styrofoam is able to isolate heat and sound by decreasing vibrations in walls. The cement brick making machine which produces styrofoam isolation blocks, is one of the most complicated static machines. This one differs fromot hers by need of human hand to put styrofoam in brick molds. You can contact us for more detailed information about the Cement Brick Making Machine. 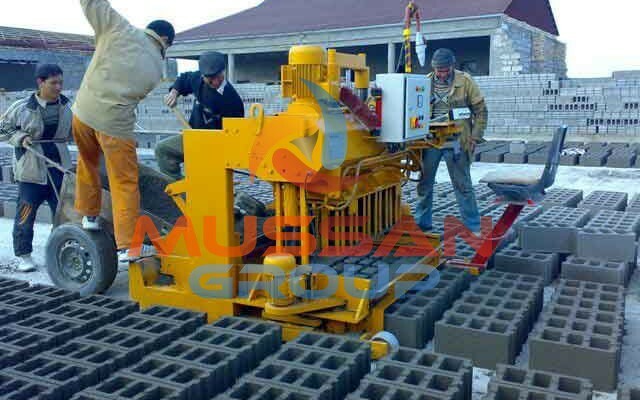 As Mussan Group, which sells its products to the whole world, you can check our references in the field of Cement Brick Making Machine from our website and social media accounts.